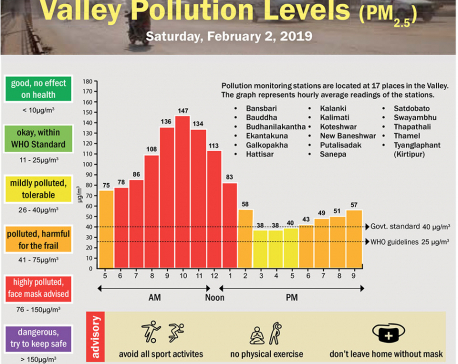 KATHMANDU, Jan 21: While air pollution in India's capital city has received worldwide attention, little has been said and done about air quality in Kathmandu, whose air pollution is on track to reach Delhi levels. Environment experts warn that if the level of Kathmandu's air pollution continues on its current track, it could reach the level of Delhi not very far into the future. “Delhi is one of the worst polluted cities in the World Health Organization list. Out of about 3,000 cities analyzed by WHO in terms of air quality, Kathmandu falls in the top 10 percent and our pollution is continually increasing,” said environmentalist Bhusan Tuladhar, who is a technical advisor for South Asia at UN Habitat. Particulate matter (PM), which includes minerals dust, ammonia, nitrates and soot, adversely affects human health more than any other known pollutant. Air quality guidelines mandated by WHO have set the limit for PM 2.5, the smallest and most harmful pollutants, at 25 micrograms per cubic meter of air (µg/m3), and the coarser PM10s should not exceed 50 micrograms, both on a 24-hour mean. Nepal follows the National Ambient Air Quality Standard 2012, which has set the 24-hour limit of PM2.5 pollutants at 40 µg/m3 and PM10s at 120µg/m3, or about twice the WHO limit. 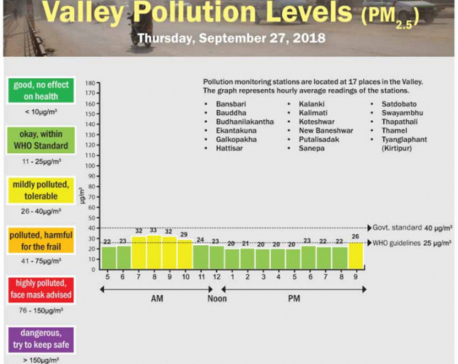 Katmandu Valley's pollution exceeds both the limits multiple times. 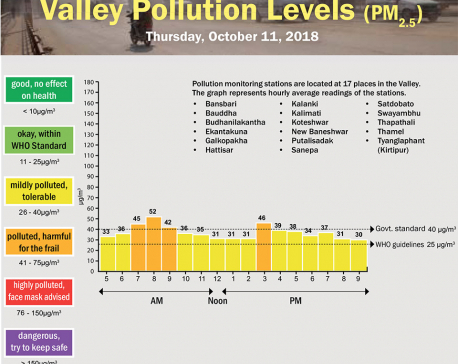 As per data from the air quality monitoring station at Ratna Park, the 24-hour average level of PM2.5, on Thursday, was 141 µg/m³, which exceeds the WHO limit by almost six times. Likewise, the PM10s recorded in the same period was 187 µg/m³, or about four times the limit set by the guidelines. Currently, there are only two air quality monitoring stations in the Valley – at Ratna Park and Pulchowk. However, Valley residents say other places, where the government has not installed monitoring stations, are more polluted than Ratna Park. “I frequently walk along the road at Kalanki and Satungal. 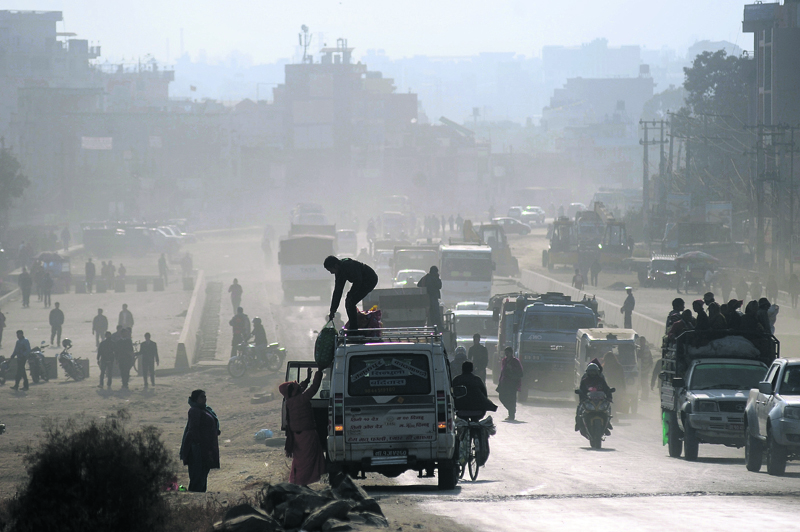 Vehicle smoke and clouds of dust stirred by the heavy vehicles are unbearable in these areas,” said Suju Kandel, a Satungal local, adding that pollution is much higher there than at Pulchowk and Ratna Park. Delhi has 13 air quality monitoring stations, and hence can monitor air quality more accurately. Data maintained by India's Central Pollution Control Board shows that quality of air in many parts of Delhi is similar to that recorded at Ratna Park and Pulchowk. “The government could be attempting to conceal the true extent of air pollution by not installing air quality monitoring stations in more areas,” Kandel of Satungal added.